How can you tell the difference between mill/backyard breeder and genuine hobbyist? An ethical breeder has higher costs of rearing the kittens, looking after both mum and dad for the year and vet bills. I suggest you avoid these Kitten Mill Breeders like the Plague, if you are going to buy a cat from someone like that, please get all the facts. Ask for vet records and do not accept the, "I can't find them" or the "I usually let the new owners take care of that" excuse. If they want to raise healthy Cats, they will have a complete vaccination record (two sets of vaccinations against cat flu and enteritis) a good healthy diet and good socialisation. Once you throw that into the equation, you will find out just what type of breeding program this person is running. 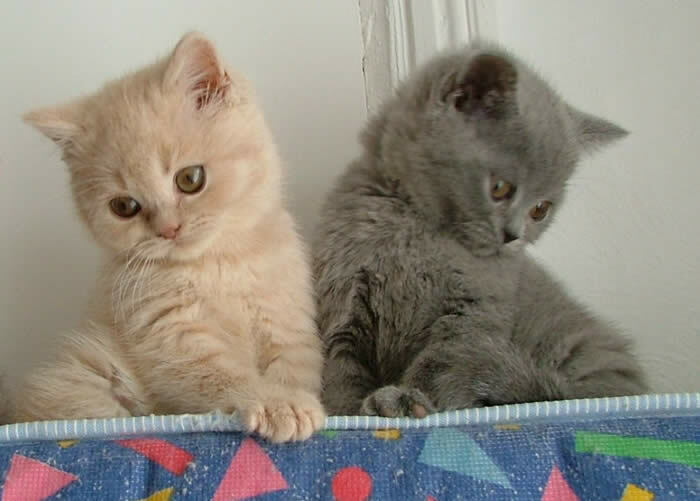 From a reputable breeder expect to pay between £250 and £600 dependent on colour and quality of the kitten. People say: "I want to have an entire cat (meaning not neutered) because I want the option of having a litter." That statement is actually very common. Unless you are trying to benefit the breed your only harming the breed by having more litters. You, in essence, have become a backyard breeder. People say: "I want my children to learn responsibility and the wonder of a cat having babies." . If you want your children to respect life, then take your children to a shelter and watch a few cats get euthanased. Tell your children that no one wanted Fluffy because she was old at 2 years old and is not considered a kitten. Tell your children Patches had to die because some one's cat wasn't spayed and they had kittens they couldn't find homes for. Tell your children Tiger had to go to heaven because every time a person gets a cat from an unethical breeder a shelter cat dies for lack of home. The "breeder" lacks knowledge about the breed. The "breeder" doesn't let you observe the kitten or adults, or let you see the cattery. The "breeder" has no vaccination records. The cats are not socialised. I cannot tell you how it pains me to hear stories of people wanting a cheap cat and then the heartache they go through because they didn't investigate. The owner seemed to really "Care" for her cats. But now their beloved cat has spinal problems, birth defects, deformities &/or diseases, the most humane thing to do for the kitty is to be put to sleep. You've lost not only money, but now also must suffer the heartache and pain of loosing your loved kitten. And where is the breeder you got your beloved kitten from? On the other line telling you "It's not my problem." Remember - the purchase price is small compared with the costs of looking after your cat properly over its life. Also remember that it is estimated that 2 in 5 domestic outdoor cats in London are infected with either Feline Leukemia or FIV or both - chronic often fatal conditions which currently can not be cured. This Information was written by Adrian Miller@ Tekno Cats, and Edited by Julie Hillyard of Mabledon BSH!